Though we love our bags and our style-mindedness, it’s always good to give back to the community. And what’s better than finding brands to support that seek to do just that? 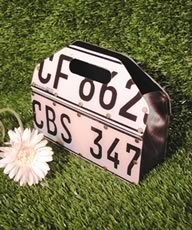 Enter Tagbag, a company that makes bags from recycled license plates and inner tubes from South Africa. And if you know your way around a car, you know that that means a pretty durable bag. So here’s the Sparknotes version of the background: on a trip to Cape Town to do relief work, South Africa, Meeshee Scherrei picked up a bag made of license plates. Pretty unique, right?